Lot 714. 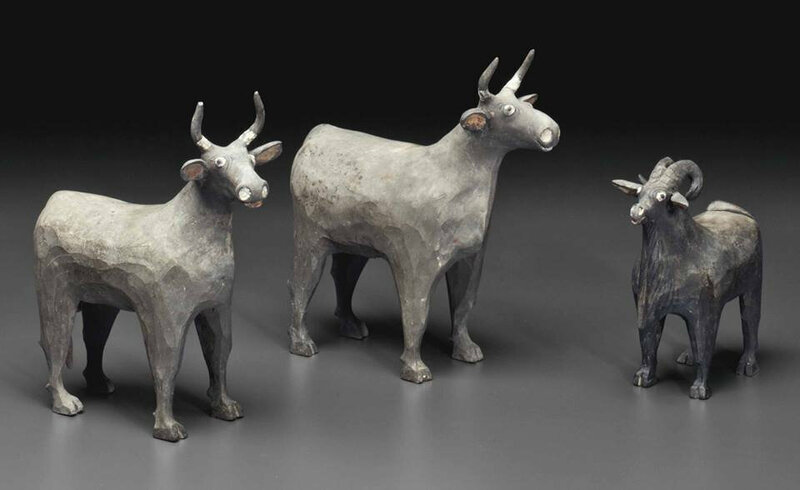 Three unusual painted grey pottery figures of domestic animals, Warring states-Han dynasty, 4th-3rd century BC. Cows 8 in. (20.3 cm.) high, ram 5¾ in. (14.5 cm.) high. Estimate USD 4,000 - USD 6,000. Price realised USD 2,500. © Christie’s Image Ltd 2014. Comprising two cows and a ram, each is modeled with knife-cut body, the facial features detailed in black, white and red pigment, with further black detailing on the horns and ruff of the ram, and traces of red pigment on the hide of one of the cows. 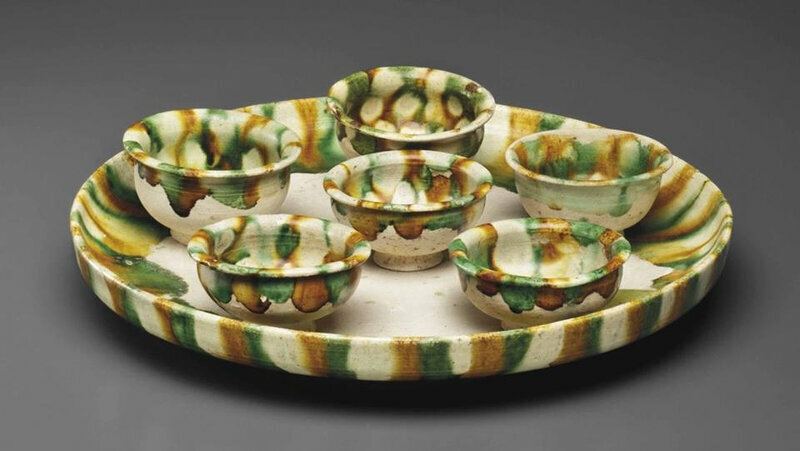 Provenance: Christie's New York, 3 June 1993, lot 157. Note: These figures are similar in their spontaneous carving style, which leaves the traces of the knife visible, to that of Han wooden figures found in the area of Wuwei, Gansu, which suggests that these figures too, are from the northwestern regions. See the figures of oxen in Gansusheng Museum, illustrated in Wuwei Handai mudiao, Beijing, 1984, pp. 9-12. See, also, the two stylistically similar pottery figures, a boar and a horse, sold at Christie's New York, 1 December 1998, lots 187 and 188. The result of Oxford thermoluminescence test no. 666k76 is consistent with the dating of this lot.